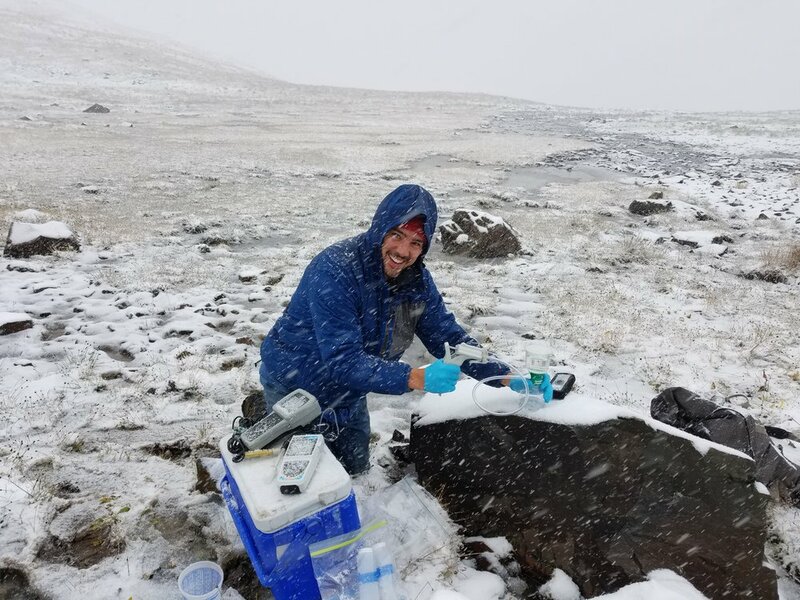 When the October 2nd forecast boasted temperatures in the teens and wind gusts up to 40mph, our sampling crew layered up in their hardiest winter gear and headed up to 13,200 feet. The top of Hurricane pass revealed a world blanketed in the first snow of the season, with wind swirling the white powder into momentary mists. GPS in hand, each crew of two sought out familiar springs that hadn’t been visited since the high flow season of spring. At the first site, Stephen Bertsch tiptoed to the pool’s edge and prepared to dip his hands into the icy pool. One by one, he carefully rinsed each bottle three times before filling it to the brim. Dr. Rory Cowie, former MSI intern and current project director, took each and labeled it for the appropriate analysis: dissolved metals, isotopes and anions. With sampling complete, they read the pH, conductivity and temperature from a submerged probe, and estimated the volume of water emerging from the ground. Each data point gives us another clue to the puzzle of how the water is connected to the mines and water table below. By comparing our 150 mine and spring sites across seasons and across years, we hope to map the underground headwaters of the Animas River and determine how to improve our water quality. As the skies finally cleared, the crew returned to the Silverton office to prepare the fifteen site samples for shipment to the Environmental Protection Agency. When you’re bundled up at home this winter, remember our hydrology crew might just be cross-country skiing above Silverton to a sample from mine portal or seep buried feet under snow. At MSI, the science never stops. Read more about our ongoing Bonita Peaks Mining District research HERE.